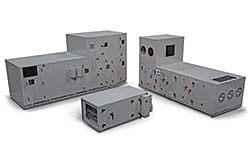 The Performance Climate Changer™ optimizes energy conservation with unit features designed to surpass ASHRAE 90.1 standards and provide flexibility to tailor air-handler selection to specific application requirements. The design includes configurations with double-wall casing panels and high-performance foam insulation to reduce air leak rates and lower energy use by 30 percent. Certain configurations feature stacked, direct-drive plenum fan arrays that provide full redundancy to keep HVAC systems working.